It’s true, the Loser Cruiser has finally met its demise. Better stated, it finally met its match on the interstate. Early Wednesday morning in the usual rush hour, a citizen following too close followed much too closely and ate the back end of our noble and trusty steed. Alas, it was a quick end. She went out with a bang, literally, and added some extra flare by creating a sprinkling of broken glass as the back side window was blown out when the wheel-well collapsed, causing the back end to crumple. 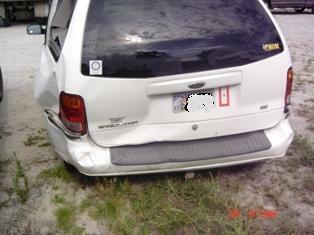 Loser Cruiser, or POS van as we were recently wont to call her, lived an exceptional life of service. She nobly carried the children to and from school for almost ten years, and in all those years of service, never once was the cause for tardiness. She valiantly withstood juice boxes, milk cartons, and in her later years, soda pop and slurpee spills. She never complained, instead, she subjected herself to the random assault from surreptitiously placed boogers and stray french fries. Her service reached epic proportions when, as the children grew and added more and more complex after school activities, she was conscripted into service as the utility vehicle for band competitions, lacrosse matches, cross country adventures, math competitions and chorus festival, and all manner of transport of other people’s children on whirlwind road trips. Of her 200,000 miles, 150,000 of them were easily tallied hauling children from one end of the fine state of Georgia to the other. She served us well, and went out heroicly doing what she had always done so well: protecting her charges. Loser Cruiser is survived by Jake, the hardy ’06 Ford pick-up truck, the Green Lantern, a little workhorse Taurus, age unknown at the time of this writing, and the Shitola, the stalwart and serviceable ’93 Toyota Corolla serving generations of Morera-Johnsons. In lieu of flowers you may send the grieving owner wads and wads of money so that she can drown her sorrows in a brand new convertible Mustang. oops! condolences for your car! I made a new blog here, away from family and friens´eyes… will be writing on it soon (and customicing its appearance and such). Godspeed Loser Cruiser. You served the J5 well! May she rest in peace, if not in pieces, and may she go where all good cars go–that big junkyard in the sky. My condolences… may she be replaced swiftly by an equally service-dedicated steed. Here’s to hoping the next car will be as faithful a servant as this one was. Oh, so very sad. A bittersweet moment. Now, tell me, honestly… you actually teared up when you wrote this obituary. Didn’t you? Not even a little. Does that make me heartless? Or just cynical? Will you accept our condolences!! Of course, Miss Dee. We know they are heartfelt and sympathetic to our grief.